Successful startup will be indicated by a dull green glow on the LED. If the LED is off, or blinking a sequence, see the troubleshooting section. Hover over and click in the dropdown menu. You can change the Device name to another 8 character name if you wish. If you have more than one IoTaWatt you will need to do this so that they each have unique names. When you press save, the IoTaWatt will restart using the new name. From then on, http://<newname>.local will be the url that you will use to access the device from your browser, and the new Device name will be the password that you must use to connect to the AP if configuring for a different WiFi network. Set your local Time Zone relative to UTC time. All of the measurements are time stamped using UTC, but log messages and various reporting apps will use this offset to show the data in local time. If your time zone is subject to “Daylight Saving Time”, check the Allow Daylight Time box. IoTaWatt has DST rules for most of North America, Europe, Australia and New Zealand. Do not Auto-update this device. Only update major releases of the software. Update with minor releases. More frequent but somewhat tested firmware. This is recommended. Recently released firmware with the latest features - and the latest bugs. IotaWatt checks the IotaWatt.com site for new software regularly. The update process takes less than a minute. 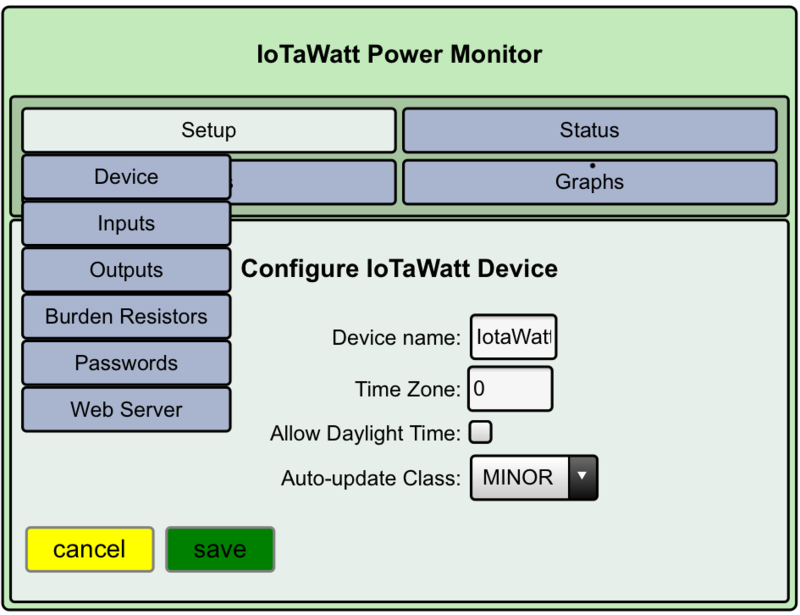 New firmware is authenticated with a digital signature from IotaWatt and installed automatically. Click . Your changes will be saved. If you changed the name of your device, it will restart when you press save and you will need to restart the configuration application from http://<newname>.local.